With the rising cost of meat, I do my best to never pay more than $3.00/lb for meat. Growing up, I despised pot roast because my mother cooked in a gravy and was very fatty. Gravy and mayonnaise are my arch-enemies in the food world. I have conceded that in order to keep a variety of options available for my family’s dinner needs, I would make pot roast for them. If they would just agree to be vegetarian, it would help so much. There are so many choices. Alas, I digress. With pot roast, you can season it and just put it in the crock and be done with it. I will actually quarter potatoes, add sliced carrots (and celery if I have it) to the bottom of the pot. I lightly season the veggies with a bit of salt and pepper. I then season the roast, on both sides with salt, pepper, onion and garlic powders. I prefer to sear the meat on both sides before adding it to the crock pot to begin its slow cooking journey. The searing is a completely optional step. I don’t always do it, but when I have the time, I do. Set the roast on top of the veggies. I had a cup or two of homemade vegetable stock. I rarely use chicken or beef stock. Making veggie stock from scratch guarantees me it’s gluten-free. With preparing the pot roast this way, it doesn’t cook in a gravy, but I can use the drippings to make a gravy, should some be requested. Add the lid, set the timer on low for about 5-6 hours (depending on size of roast). When you return home, the house will smell wonderful and dinner and the side dish is done. A nice salad would compliment this dish, but again, it’s optional. Yesterday, I reblogged a post about a Sweet Potato and White Potato Gratin. It looked so good that I had to try the recipe. So I did; last night. Here’s my review of the recipe. First, it’s a very easy recipe to follow. The above link has the recipe and directions, should you want to try for yourself. First I shredded the cheese. I don’t use pre-shredded, because they add a coating to the cheese to keep it from sticking. Then I mixed up the spices…. I used Tarragon instead of Rosemary, because that’s what I had on hand. I don’t think it hindered the final result at all. I have a mandolin that has two thickness settings. So I set it on thin and then just sliced what I needed for the recipe as I was layering the sweet and white potatoes. I didn’t need to soak them in water, as the recipe calls for, by doing it this way. The nice thing about using Yukon gold, or any potato with a thin skin, is you don’t have to peel the potatoes first. You can just slice them after you give them a good rinse. I continued following the directions and started layering the potatoes. I prefer to us scallop design (overlapping). I admit, it’s not the prettiest dish when all is said and done. It’s a bit dark on the edges, but don’t let that stop you from making this. My family, who aren’t “potato people”didn’t care for it. They chose to eat steamed rice instead of this. However, this is nothing new. My husband is Filipino and my daughter is half-Filipina. Rice is a staple in our house and they would that with every meal if I let them. I LOVE potatoes. I tried it, just as prepared and thought it needed a bit more salt and pepper than was originally used in the recipe. Also, when using 8-oz. of cheese, you will have excess liquid (oil) in the pan because of this. I’m going to play with the recipe and perhaps mix in a little (gluten-free) flour to correct that. That’s just my personal preference. All in all, I think this dish is a keeper. I really wasn’t in the mood to have chicken last night, with the rest of the family. So, I prepared some peas and between the potatoes and peas, I had a very nice vegetarian dinner. If you’re inclined to try the recipe, I’d love to hear your thoughts. 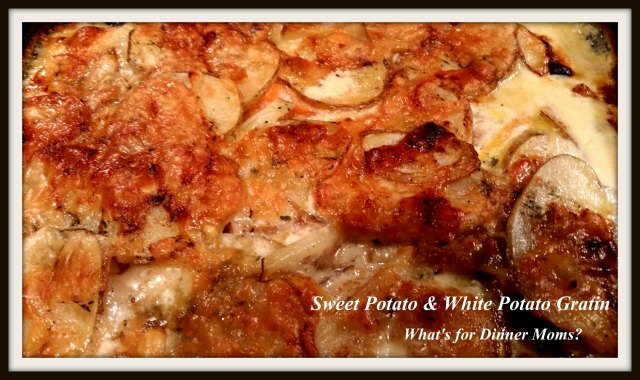 Sweet Potato and White Potato Gratin – Thank You ALL! Originally posted on What’s For Dinner Mom, I had to share this yummy-looking recipe. Not only is it gluten-free, but it uses some of my favorite ingredients: potatoes, sweet potatoes and Swiss cheese! Comments disabled here, so please comment on original post. Thank you! Thank you! Thank you! I hit my 500th follower yesterday! It took 2 1/2 years for me to get to 300 followers (I really don’t count my first year of blogging) and only 3-4 more months to get to 500. Thanks to HarsH ReaLiTy and Dream Big, Dream Often (click for links to these blogs) I have finally started to learn how to grow my blog. With time and patience it has been paying off. Thanks to all!